Stoltzfus Woodworks has been manufacturing custom sheds, garages and animal structures for over 32 years. We sell our quality buildings all along the east coast from Boston to Virginia. Headquartered in Lancaster, PA, Stoltzfus Woodworks is a 2nd generation family owned and operated business. Our experienced craftsmen take pride in creating attractive, affordable buildings that offer tons of features as well as exceptional convenience and functionality. 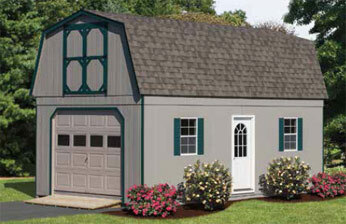 Choose from a variety of shed and garage styles to match your outdoor decor. All of our buildings can be completely customized to suit your needs. Feel free to make suggestions on window and door placement that may be different from what you see in our website photos. We can accommodate almost any configuration. Plus, we offer a variety of custom doors, larger windows, loft space options, decorative cupolas, window vanes, ramps and much more to make your shed or garage truly your own. At Stoltzfus Woodworks, quality is always our top priority. That's why we only use premium-quality lumber, hardware and shingles to build our quality sheds, garages and animal structures. Our buildings are built to last for generations and are backed by our quality guarantee!